My name is Kelly & I am 32 years old. 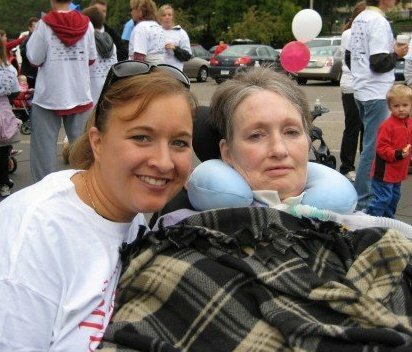 My mother was diagnosed with ALS when I was 26. I was living in Boston at the time and had no idea what ALS was. I vividly remember looking the disease up while I was at work….and crying at my computer. If you Google ALS, it is not pretty! My mom and I have always been the best of friends. When I found out what ALS was….I was DEVASTATED! I couldn’t believe that these significant changes would soon change my mom from the woman that I knew her to be. I immediately moved home to help my family out. I am now my mom’s primary caregiver, and taking care of her is my full time job. About 3 years ago she was put on a ventilator (which only 3% of patients in MN choose to do). We live a fun life & try to prove everyday that living on a vent can be done….and worth it! It would be impossible without the love and care of my family, but just seeing that smile on my mom’s face…makes it all worth it :). ALS has made my family what it is today. We have never been closer, but it has also offered us many challenges. My thoughts with starting this blog…are to send hope and inspiration to other families affected with ALS. And to also show the small miracles that God has provided us through this experience. Thank you for visiting! Hi Julie, Kelly and Family, You all are truly amazing and give inspiration to all of us. It’s so good to hear Julie is staying strong – will try to visit next week! We would love to see you Gretchen! My mom & I would really enjoy that!